Cornwall’s spectacular coastline is a favourite holiday destination for those seeking sun, surf and sailing. And where there’s sun and sea, there are also good Watering Holes, some of the finest of which are listed below. Cornwall is also a favourite holiday destination for people who enjoy walking and what better place to end a walk than at a nice pub! Set on the north-western edge of Bodmin moor, Blisland Inn has won many CAMRA pub of the year awards, as you’ll see on the front of the building. The proprietor claims to have served more than 2,550 varieties of beer … and counting. The Blue Peter, overlooking both the sea and the picturesque harbour, is situated on the quay side in the beautiful Cornish fishing village of Polperro. It’s often referred to as “the last pub before France” or as simply as “The Blue”. Well, you definitely can’t leave for France without a last drink. The Gunnard’s Head is a restaurant and pub with rooms to let. It’s near Zennor on West Cornwall‘s Atlantic coast. This beautiful 15th century village pub is located in St Kew Churchtown (near Bodmin and Wadebridge) in north Cornwall. Looks really cosy and cute. Pandora Inn is one of Cornwall’s best-known inns. The thatched, 13th-century building is set in a scenic location and enjoys panoramic water views. The Rashleigh Inn sits on the beach between the seaside village of Par and the historic town of Fowey. Polkerris is located on the east of St. Austell Bay and is accessed by a typically ‘Cornish lane’ that leads to a large public car park. The Inn also has a car park so if you continue down the hill – just before you get to the sand – make a right turn. The Watering Hole is in the middle of one of the best beaches in Cornwall and looks very much like a surfie’s hangout. It’s only accessible by walking across the beach. Robert Job, the owner, took a snack shack and transformed it into this cool looking pub with a great menu. 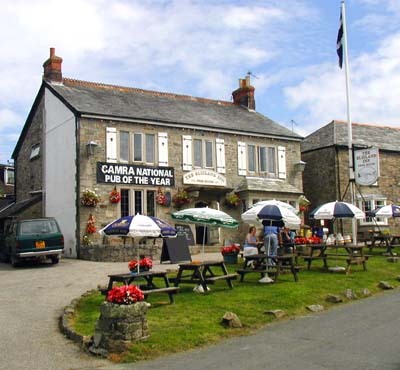 More Pubs in Cornwall, Click Here.